I miss being in my 20's and having nice clear skin. The older I get, the more I notice my skin isn't the same color...it's not one tone. So, I use a lot of foundation to cover that up, and that leaves my skin oily. In the Florida heat and humidity, it's also very common for my foundation to never really dry on my skin, which means when I use my phone, or touch my face, I am left with a phone or hand with makeup on it. I really wanted to try a spot corrector, since I'd heard about them, but was skeptical. I decided to try Artistry Ideal Radiance Spot Corrector. Infused with some of the world’s most intensely brightening botanicals, this highly concentrated treatment safely targets even the most stubborn visible hyperpigmentation in all skin tones and ethnicities. In just one week, the appearance of darks spots and discolorations dramatically diminishes, leaving skin more even toned and radiant. Correct with pearl protein: The pearl has been renowned as a beauty treatment since ancient times. 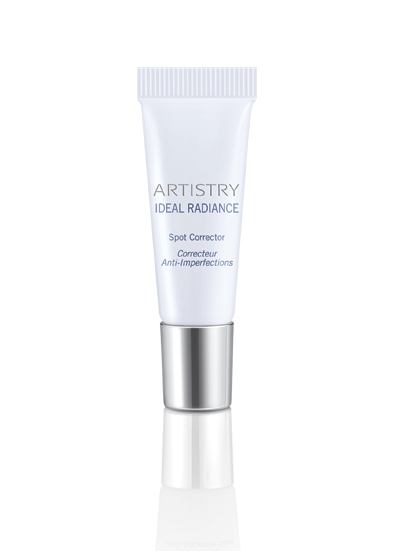 Artistry Ideal Radiance™ Spot Corrector is the only brightening product with 100% luxurious pearl protein extract to help even skin tone and treat visible dark spots and discolorations. Prevent with 3D Technology: This patent-pending liposome delivers brightening acerola cherry, soothing licorice, hydrating ceramide 3, and key botanical ingredients to the skin’s deepest surface layers for fast, targeted results. I am really excited to say, it does work. I used it twice a day for a week, and the spots of uneven tone were not gone, but definitely fading, meaning I could use less makeup daily than I was using in the past. I am positive that with more use, the spots will get even lighter. You can purchase this and other Amway products here.